America Online launches a new subscription plan offering their subscribers unlimited dial-up Internet access for $19.95/month. 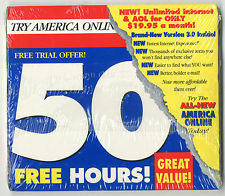 Previously, AOL charged $9.95/month for 5 hours of usage. The new plan brought in over one million new customers to AOL within weeks and daily usage doubled among subscribers (to a whole 32 minutes per day!). This huge increase in usage overloads AOL’s infrastructure with the result being that many of their subscribers could not access the service. Class action lawsuits were filed by angry subscribers who could no longer access the service they were paying for. Regardless of their trouble, by offering unlimited Internet access for a reasonable fee, AOL helped facilitate increased adoption of Internet usage among a public still becoming acclimated to the “Information Superhighway”.